Thaw frozen vegetables in the microwave (or place entire bag in a bowl of hot water for about 10 minutes). Set aside. For sauce, heat oil in a small saucepan on medium heat. Add ginger, garlic, scallions and lemongrass, and cook gently until tender but not brown, about 2 to 3 minutes. Add curry paste, and cook for an additional 2 to 3 minutes. Add coconut milk, honey, soy sauce and fish sauce, and bring to a boil over high heat. In a bowl, mix cornstarch with chicken broth. Add mixture to the saucepan, and return to a boil while stirring constantly. Lower heat to a simmer, and add chicken strips. Simmer gently for 5 to 8 minutes. Add thawed vegetables, and continue to cook gently with lid on until the vegetables are heated through, an additional 2 to 3 minutes. 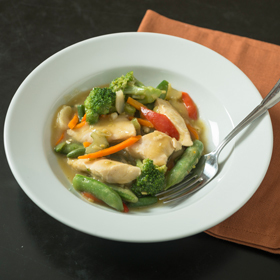 Divide into 4 even portions, each about 3 ounces chicken breast and 1 cup vegetables, and serve. Tip: Delicious served over rice or Asian-style noodles (soba or udon). Serving size: 3 ounces chicken, 1 cup vegetables. Amount per serving: 207 calories, 7g total fat (3g saturated fat), 14g carbohydrates, 23g protein, 3g dietary fiber, 249mg sodium.